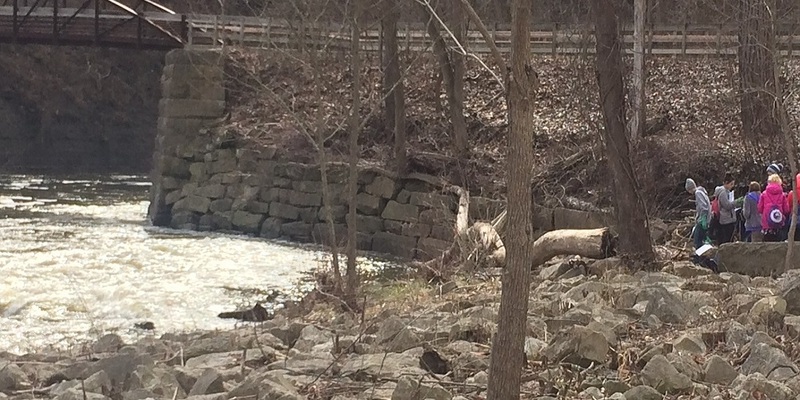 It’s still late winter, but there’s something blooming in the Cuyahoga Valley National Park. It’s a partnership among Coventry Middle School, the park and EarthEcho International, a nonprofit environmental education organization. Sixth-grade science teacher Jim Trogdon and a group of 47 students and five teachers were at Lock 29 on Thursday to test the water quality of the Cuyahoga River as part of EarthEcho’s Water Challenge and a two-day, three-night stay at the Cuyahoga Valley Environmental Education Center. Their findings will be entered into a worldwide database. 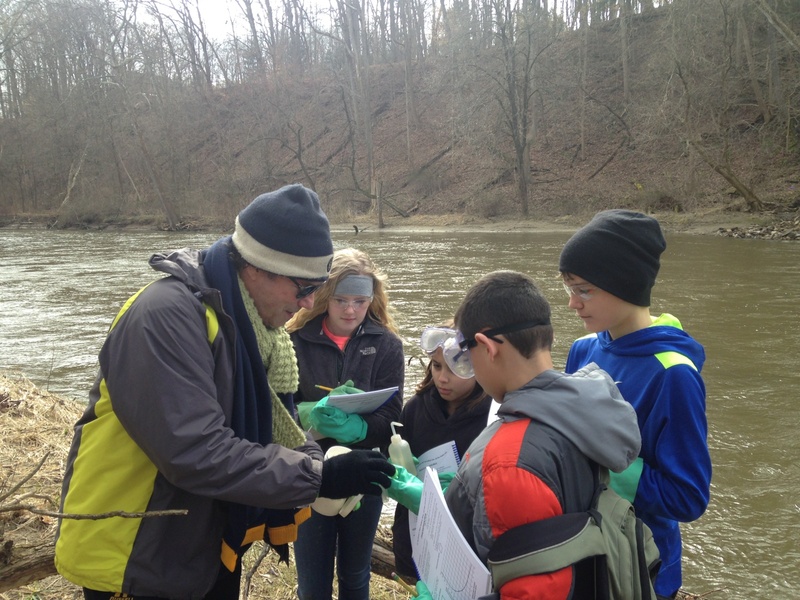 Students from Coventry Middle School with science teacher, Jim Trogdon, test water quality on the Cuyahoga River. The challenge builds public awareness and involvement in protecting water resources around the world by engaging citizens to conduct basic monitoring of their local waterbodies, according to the group’s website. “We are an organization that wants to empower young people to take action right now for a sustainable future,” said Stacey Rafalowski, education director for the group in Washington, D.C. She was in town for the start of the partnership and to observe the students. EarthEcho was founded in 2000 by siblings Philippe and Alexandra Cousteau in honor of their father, Philippe Cousteau Sr., son of explorer Jacques Yves Cousteau. Trogdon serves as an education adviser to the group and brought EarthEcho, the park and the school together. EarthEcho maintains the database, which has been around for a decade, Rafalowski said. It has reached 1.5 million participants in 125 countries. Anyone can access and use the data, she said. The students were divided into three groups to measure phosphates, dissolved oxygen and pH and turbidity, or cloudiness of the water. On muddy banks, they used a milk jug tied by rope to what looked like a thick tree branch to retrieve water from the cold and rushing river. They poured the water into tubes and added chemical pellets that changed color to indicate the level of material they were looking for. Sixth-grader Mahmoud Jaber, 12, was testing phosphate levels. He swirled a small white pellet around his test tube, waiting five minutes to see what color the water turned. He showed a chart with colored circles indicating the level of phosphates in parts per million. “We’re hoping to get white,” he said. Put simply, too many phosphates can lead to a dead zone in the water. “That’s happened in Lake Erie multiple times,” he said. After testing, the students were going to chart the results and grade the health of the river. Another group of Coventry Middle School students testing water quality with a Cuyahoga Valley Park Ranger. The water testing is part of the residential program called All the Rivers Run at the Cuyahoga Valley Environmental Education Center. Coventry has been participating for about 20 years, but this year Trogdon won an all-expenses paid stay for the students as part of Google’s School of the Year scholarship program. The majority of the classes are taught outside, said Katie Wright, director of the Cuyahoga Valley Environmental Education Center. For one of those classes students go to Lock 29 to do water sampling, where they’ll learn about the health of the river. It’s the perfect partnership, Trogdon said, because the Conservancy for Cuyahoga Valley National Park program involves thousands of kids coming through, and they are testing the water every week. “Now we can look at these results and see, is there a pattern? Maybe we have some area where we think we have a problem with phosphates, really high levels, and where might that be coming from?” he said. The program gives kids a chance to put down their electronic devices, Trogdon said.